At Safe Living Solutions, we help people create the homes they want and need. 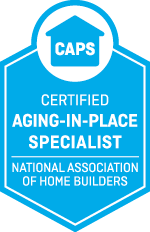 Specifically, our clients want to remodel their homes so they are more accessible, safe, enjoyable and easier to live in. We visit your home to talk with you and perform a home assessment, and covers your current and future needs. We provide you a written plan that shows you our recommendations for the modifications you should make to your home. We guide you through all the design and product decisions to ensure your space works and looks like you want it to. Through the entire process, our team of experienced accessibility specialists and contractors will manage your project. Who don’t have serious health or mobility problems now, but want to plan for later in life. With long-term or severe conditions a home that is more safe and easier to live in. Sudden changes in their health, mobility or needs, and require home modifications. Living a full life, now and in the future, in a home that is well-suited for them. Whether you are in the 3rd act of life or caring for aging parents, many clients see the value in investing in their safety and home, so they can live there longer. Combining home modifications and renovations to create the environment a person with a long-term condition or specific physical requirements may need. Now more than ever, we’re seeing people step forward to make changes to their homes that can keep them from getting injured, which can keep you there for longer. Often times, we are able to space home modifications out over time, so that you make changes the changes you need now and save other ones for later. The truth is, our clients are choosing to invest in their homes, so they can live there more comfortably and safely, and for longer. If that sounds like you, we would love the chance to talk with you about how you can have the things you want and need now in your home, while preparing for later in life.